Sent to the Head of Security at the Arndale Centre. We are writing to you with regard to the conduct of one of your security staff members at the Vodafone demonstration on Saturday the 20th October. As she was not wearing a name badge, we cannot say what her name was, but we have attached a photograph [redacted – details as to where she is in the attached photo]. 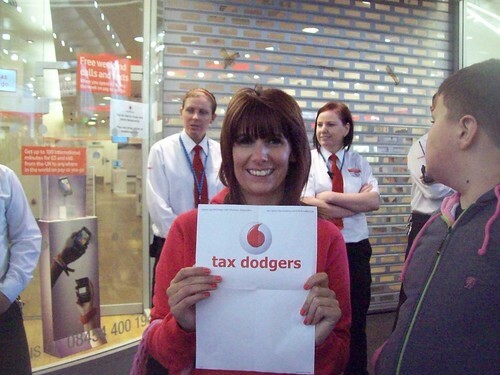 As we are sure you are aware, several people took the decision to demonstrate at a Vodafone store because of the £6 billion tax bill that Vodafone was let off by the government, in the same week as the Chancellor announced a £7 billion cut to the welfare budget. This is hugely unfair and will render thousands of people destitute, including many of those in work, and hundreds of thousands of people may lose their homes. We therefore felt it was important to hold a peaceful protest in order to express our outrage at this. We had an extremely positive response from the shoppers who passed by the demonstration, and many thanked us for drawing the issue to their attention. Indeed, some spontaneously joined us! Early on during the demonstration, as security staff were still arriving, the staff member in question was overheard telling another member of staff who had just arrived that the demonstrators had been “shoving at the doors” of the shop and that security had had to hold people back. An impartial legal observer was present at the time and reported that he had not witnessed shoving from any of the parties involved. Contemporaneous notes are available to support this. We concluded our demonstration at approximately 4pm. One of us (Sarah) then turned to the security member in question and politely asked if she had a Vodafone contract, as we had asked many people that day. This apparently provided her with the opening she’d wanted to rant about what a disgrace we were for depriving someone’s freedom of speech; it seemed someone who objected to the protest had been heckled by a different group who had attended. She claimed that this group had shoved the objector away from a microphone which was being used to address passers-by. At this point, Josie joined the conversation to object to the accusations of shoving, as there had been no physical contact involved (this will be confirmed by CCTV). The member of staff denied having accused anyone of shoving, despite the fact that we had both heard her say it moments before. She continued to say that our demonstration was “pathetic” and “sad” and that we didn’t have the right to protest because “half of you don’t pay taxes or have a job anyway”. Josie asked what evidence she had that we were unemployed and how that had anything to do with our protest. The staff member then once more denied that she had said any such thing but continued on the same theme and said that our protest was “pathetic” again, because one protestor had received a fine for fly-posting earlier on in the day, and had no way of paying. We tried to ask whether she didn’t find it odd to be denouncing one of our protestors for being fined £50 he couldn’t pay and defending Vodafone getting away with an unpaid tax bill of £6 billion, but she merely continued to call us sad over and over again. We pointed out that she was as likely to end up unemployed as anyone else, because with the cuts that have just been announced and the subsequent effect they are going to have on the economy and business, nobody’s job is safe; she informed us that “I don’t care, I’ve got a job for life”, because “there are some things which are certain in life, death, taxes, food and securing a building. This mall isn’t going anywhere, they can’t get rid of me.” She then began to ask us why we were still here, and began to make shooing gestures, saying, “go on, you’ve had your little protest, now just go away, go on, just go away”. We are sure we needn’t point out how discourteous and unprofessional the behaviour of this security staff member was. While some of us may well have an extremely low income, the two of us have personally spent hundreds of pounds each in Arndale shops, as have most of our fellow protestors. Being treated like this by someone who emphasised repeatedly that she was one of your employees has discouraged us from wanting to visit particularly often in the future. This letter of complaint has been published on SarahMcCulloch.com (8000 hits a month) and via various social networks including Sarah’s Twitter page which has 6700 followers. We would be most appreciative to receive a response detailing what steps you will take to deal with this most unfortunate smear on the reputation of the Arndale Centre; we would be happy to publish your response to the same audience. We acknowledge receipt of your letter dated 1st November 2010 concerning an incident which took place on 20th October 2010. We view this very seriously and will be undertaking a comprehensive investigation of all the facts concerned in this matter and will respond to you early next week. Vodafone, we pay taxes, why don’t you? don’t be surprised when nothing gets done about your complaint. How do i know nothing will get done about? because I’ve been on the receiving end the female in questions unprofessional comments my self. she seems to be under the impression that she is gods gift to the security industry. trust me i know what happens next, you will be told that the matter is being investigated but what will happen is that it will be swept under the carpet and she will get away with it yet again. if you want to ensure that the matter is dealt with properly make sure you contact a mr g barkworth on a regular basis if he is getting bad press he will guarantee something is done. trust me this is how it works. i should know! happy to help out sarah. also i made some further enquires and found out that her partner is the security manager believe it or not which makes you wonder if anything will be done about your complaint at all or as i mentioned before it gets swept aside?